We all knew it was coming. But now, it’s Facebook official: Bread is back. We mean, of course, back in the trendy sense for other people since we and all of you have been hip to this for years. In other words, when your friends and family get back on the bread trail, lamenting all those years of uneaten comfort, you can just knowingly nod while feeling smug inside. “Food start-ups are innovating bread with processes like ‘slow carb baking,’ or slow natural fermenting,which creates breads with lower glycemic indexes (GI). In the process, they are also creating loaves with increased bioavailability of nutrients.” Can we talk about the phrase slow carb baking? Gross. It’s been called sourdough for thousands of years, but that is apparently not good enough for Bread 2.0. So, our evolved and sophisticated friend, are you ready to dabble even deeper in this “new” trend called BREAD? We have some einkorn baguettes, a semolina loaf with sesame and charred leeks, a buckwheat-barley round, a s’wheat raisin heavy on the whole grain and a whole bunch more! 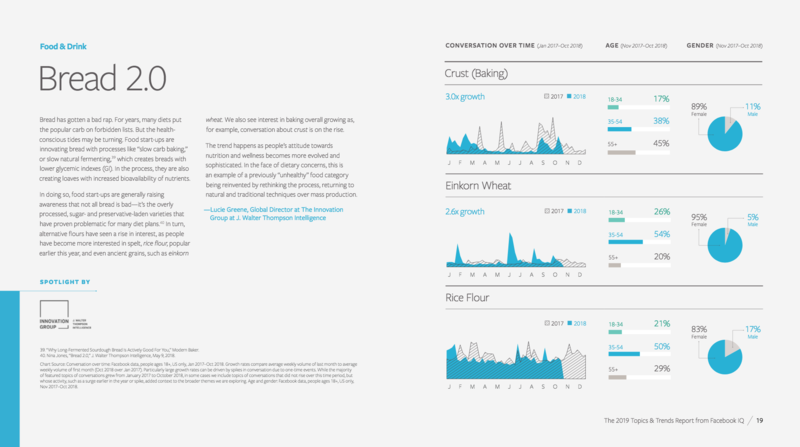 Here’s the bread page from the report, should you want to check your coolness before you wreck said coolness.